Hollocombe's DragonFolk are Wendy - accordion, Chris - flute, Jackie - flute and percussion, Steve - guitar. DragonFolk brought us a variety of traditional tunes from around Europe. Not just a multiple-award-winning organic farmer but a folk singer and songwriter too! Tim's songs are about Devon, its countryside and farming. Caroline appeared at the HMC in October as part of 'All Bar One'. An excellent vocalist and guitarist, we are very pleased she came back again to perform a solo set of her favourite songs. Ed and Sherrie Collinson, from Winkleigh, have been entertaining themselves (and anyone else who will listen!) for well over forty years. They sing an eclectic mix of jazz, blues, country and folk, based on acoustic guitar and vocal harmonies. Josie sings and plays blues and ragtime from the early 1900's, along with more contemporary blues material delivered on a steel-bodied National Resophonic resonator guitar. 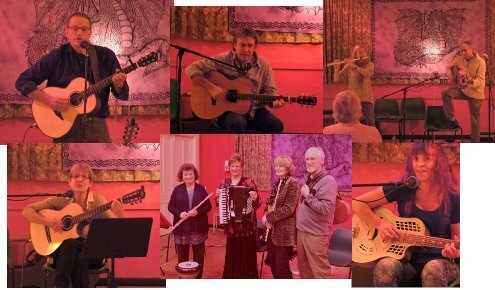 Chris is an experienced folk musician, singer and multi-instrumentalist. Chris was joined by flautist and fiddle player, Sue Eeles. Both Chris and Sue are regular members of Sheer Hopody Barn Dance Band.